When the news came out of the fate of the Leyte Mayor Espinosa yesterday, my aunt was wailing. How can Duterte sleep at night? She cried. Everyone deserves a fair trial. She’s right, of course. You can’t just go killing people, never mind the norm nowadays. One of her fears, most likely, is that her son (currently the city mayor and aligned with former President Aquino) may be next, all for being related to the wrong people. And with the current political climate, I might say her fears are probably not unfounded. Albuera, Leyte Mayor Rolando Espinosa and drug suspect Raul Yap were killed in a shootout inside the Baybay City Provincial Jail early Saturday morning. Operatives of the Criminal Investigation and Detection Group (CIDG) Region 8 were at the jail to serve search warrants on the two detainees for separate cases when the latter fired at the cops and a shootout ensued, Philippine National Police (PNP) Regional Director Elmer Beltejar said. The cops were about to serve a search warrant on Espinosa for violation of Republic Act No. 10591 or the Comprehensive Firearms and Ammunition Regulation Act. Espinosa had been arrested for drug-related charges. The CIDG was also going to serve a search warrant on Raul Yap for charges related to violation of Republic Act No. 9165 or the Comprehensive Dangerous Drugs Act. The search warrants were issued by Judge Tarcelo Sabarre Jr. of the Regional Trial Court Branch 30 in Basey, Samar. Beltejar spoke with GMA News Online before 7 a.m. Saturday and confirmed Espinosa’s death. He said elements of the CIDG Region 8 led by Police Chief Inspector Leo Laraga arrived at the Baybay City Sub-Provincial Jail in Brgy. Hipusngo at 4:10 a.m. on Saturday to implement the search warrants. “It was a warrant application. It was purely CIDG. Walang coordination with PNP Region 8,” Beltejar told GMA News Online. Elements of the Scene of the Crime Operatives, who arrived at the scene at 5:58 a.m., recovered a Super Caliber .38 pistol, a magazine of live ammunition, a small, heat-sealed sachet of suspected shabu, and several drug paraphernalia in Espinosa’s cell. Meanwhile, a 45-caliber pistol, a magazine of live ammunition, 10 big heat-sealed sachets and five medium-sized heat-sealed sachets of suspected shabu, 27 big heat-sealed sachets of suspected dried leaves of marijuana, and several drug paraphernalia were found in Yap’s cell. Elements of the Scene of the Crime Operatives arrived at the jail later to process the crime scene. Now this city is as anti-Duterte as you can get, with Mar Roxas leading in the last elections. People are highly critical of the trash-talking , Pope-cursing, China-worshipping President. EJKs are naturally blamed on the guy who encourages it. And so it follows, everyone is blaming Duterte for Espinosa’s death. Therefore Duterte hates the Espinosas and must have had Espinosa (the father) killed. I mean this was clearly a case of EJK with a half-assed cover-up. Who else could have killed him? Espinosa and fellow slain inmate Raul Yap fired shots while being served a search warrant at the Baybay Provincial Jail in Leyte by operatives of the PNP’s Criminal Investigation and Detection Group (CIDG) Region 8. “Silang dalawa ang nagpaputok sa operatiba natin at napilitan po yung mga operatiba natin na gumanti at ito po yung nagresulta na ikinamatay ng mga suspek,” said CIDG Region 8’s Supt. Melvin Marcos. A hard drive containing video footage of what may have transpired during the shooting incident which led to the death of Albuera, Leyte Mayor Rolando Espinosa Sr. is missing, a provincial official said. 1) Why would you implement a search warrant at 4 am ? 2) If I were already in jail, what’s the point of manglaban? Sumuko na nga ako. 3) And, considering all the fatal ‘nanlaban‘ cases, why would I even risk it? I mean to shoot out at CIDG operatives when I’m already in jail is just about the dumbest thing ever. 4) And now the CCTV footage of the cell is missing! WHY? If the CIDG wants to clean their name, their best bet is to release the video to prove that the Mayor did shoot at the operatives FIRST. Majority of those around me are saying they see Duterte’s fingerprints all over the place. But some things don’t add up. Gusto ko yung mga snarky comments ng anti Duterte people na akala mo alam na alam nila ang nangyari. Gusto ko yung nag prepretend silang tanga, kunyari di nila alam na ang makikinabang sa pagkamatay ni Espinosa si De Lima at ang mga drug lords. Kunyari pa kayo. Wag kami. Don’t us. Mabilis hindi maging tanga. Magbasa ng news tungkol sa pangyayari. CIDG kasi at hindi local Baybay police ang gumawa nito. Umarte ng naaayon sa alam at ganda, bes. Una sa lahat, hindi local Baybay police ang pumatay kay Espinosa. CIDG, who went there at, tadaaah, 4 am. Mga bes, alam nyo bang considered forced entry ang CIDG don? Kaya ako concerned na wala si Bato dito kasi kung nandito sya sana natawag agad sa kanya ang pagtangka ng CIDG at baka nasolusyonan. Yan ang tinatawag na timing. “Chief Superintendent Elmer Beltejar, the Eastern Visayas police director, said there was “no coordination” with his office by the Criminal Investigation and Detection Group Region 8 office, which carried out the operation. 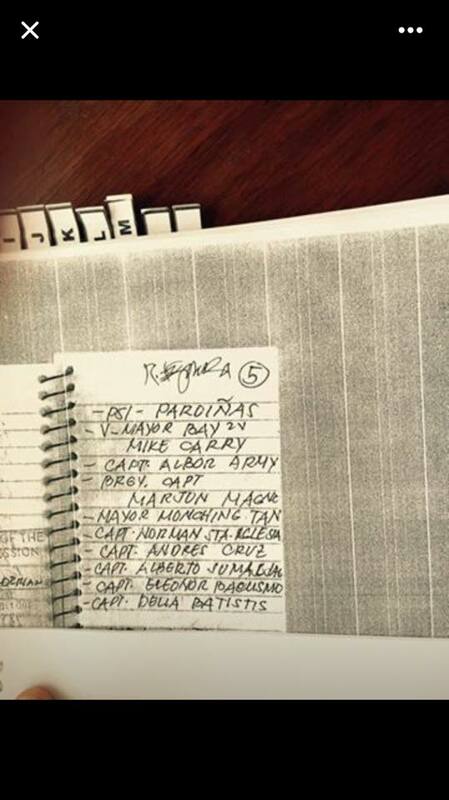 And a source within the Leyte jail management system, who asked not to be named for lack of authority to discuss the matter, said there was a standoff and what he described as a near shootout when guards at the Baybay jail refused to allow the CIDG agents inside because they supposedly did not have copies of the search warrants with them. Who wants the head of Espinosa? Ang daming pangalan sa blue book nya. Aside from De Lima, many of Leyte’s top politicians are there as protectors, including, allegedly, some of the members of the Petilla-Loretos, one of the oldest political clans, as well as Lucy Torres Gomez’s brother, Matt. Why is this list unreleased? kailangan daw ng 2 corroborating evidence. Isa na lang ang kailangan na evidence kasi may returned checks made out to some of the protectors. Kasama sa listahan na ito ang ilang congressmen, board members, etc. May sinumpaang salaysay si Espinosa, but it would have been better if he was alive. According to a well entrenched, politically connected friend from Leyte, who I just talked to minutes ago, some of these congressmen secretly met to plan to oust Albuera police chief Espinido as he cannot be controlled by anyone. See: Gomez wanting to Espinido to be killed.Facebook rant lang naman. Why? Hindi ko masyadong naintindihan maliban sa ini implicate ang kapatid ni Lucy. See attached photo: The Vanguard is a local paper in Leyte. Albuera police chief Espinido wanted Espinosa to be retained in Albuera jail, but he was transferred to Baybay, because of jurisdiction. I maintain that the government should have gotten Espinosa because this is not a normal case. Do not forget, only a couple of months ago, pinatay din ang lawyer ng mga Espinosas, inside his car, in Tacloban City. Ano, ayaw nyo pa ring maniwala na malala ang drug problem sa bansa? Ano, kunyari nagtatanga-tangahan kayo? Kayo ang magising. Several police officers, members of Congress, including a senator, are among the cohorts of alleged Eastern Visayas druglord Kerwin Espinosa, his father Albuera, Leyte Mayor Rolando Espinosa said in a news conference on Tuesday. A report from Jay Sabale on “24 Oras” said Espinosa was about to reveal the identities of some 30 individuals he mentioned in his affidavit before he changed his mind for fear his life and those of his loved ones. “Ang buhay ko ngayon ay, kumbaga maliit na lang. Nanganganib na ang buhay ko,” Espinosa said. After breaking into tears in his news conference, Espinosa started spilling the beans on the personalities mentioned in his affidavit. “May mga members sa PNP… may members ng Kongreso,” Espinosa said. Asked if his affidavit included a senator, Espinosa slightly nodded. Albuera chief of police Chief Inspector Jovie Espenido claimed he saw the ledger that was the basis of the affidavit. 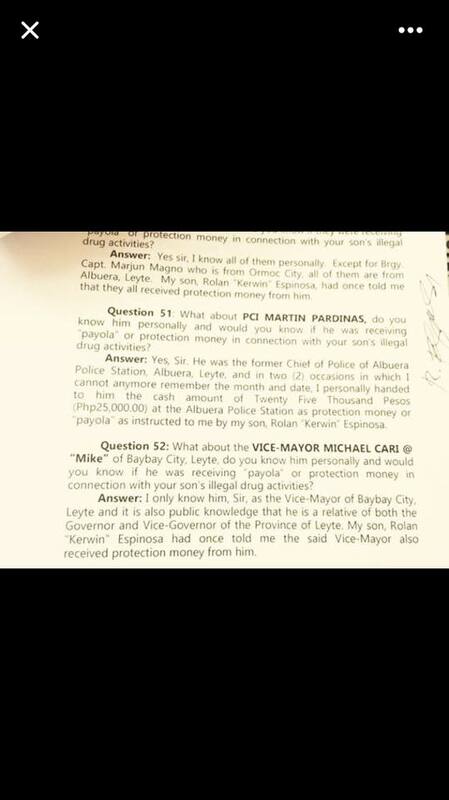 Espenido confirmed the affidavit pointed to a senator who is probably a former secretary of justice. “May senador nga. May senador (na) isa, nakita ko. Dating secretary ng DOJ siguro yun… Nakita ko lang,” Espenido said. Roxas, Tristan. 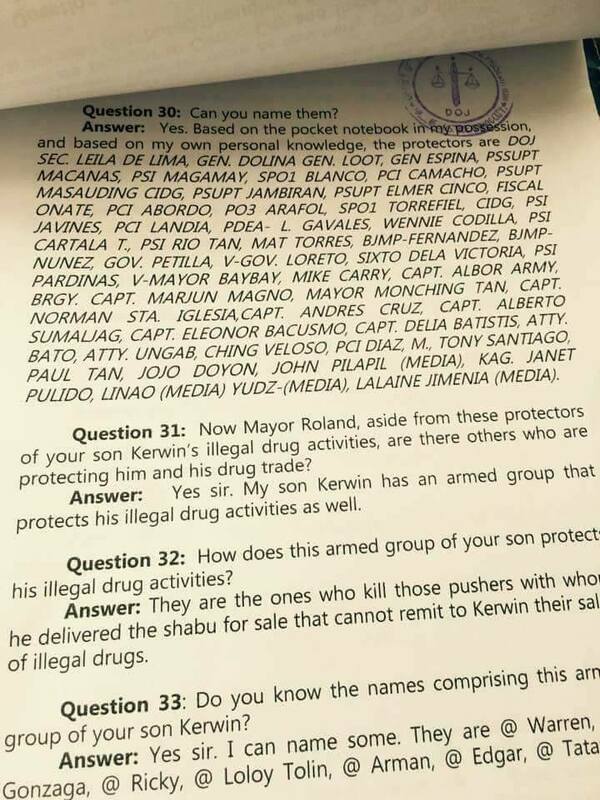 Rolando Espinosa names cops, lawmakers as Kerwin’s drug cohorts. GMA News Online. Noli De Castro @ 7:43 : Kasi pag patay na si Espinosa, eh puwede na tumanggi yung mga pinangalanan nya. Noli De Castro @ 9:25 : So kayong naniniwala na posibleng patayin si mayor kung hindi niyo bibigyan ng proteksyon? Patayin ng mga taong maaring nasa listahan o ipapatay? Chief Inspector Espinido: Proven yan kabayan. Proven yan. Yan naman talaga ang grupo. Talagang pati pamilya mo ubos. It doesn’t make sense for Duterte to kill Espinosa. After all, he could have used Espinosa to roast De Lima, his archenemy, and fry other big fish. True, Espinosa had already signed a sworn statement implicating her and all the others, but we all agree- it would have been better if he were alive. Besides, wouldn’t this spook Espinosa the son? When it’s a death warrant to surrender, what you have got to lose if you flee? What I’m saying is, it’s not a wise move for Duterte to kill his own ‘alas‘ against De Lima and the others implicated in the affidavit. He may be all these terrible things, but Duterte isn’t stupid. Think about it. Remember, even Espinosa knew his life was in danger – which is why he sought police custody on August 24th. And he knew it wasn’t from the police either. And the chief inspector, Espinido, knew what was coming. “It was purely CIDG. Walang coordination with PNP Region 8,” Beltejar said. *Featured image from ABS-CBN News. Used without permission. This entry was posted on November 6, 2016 by ikalwewe in crime, For real?, politics, thoughts, Uncategorized and tagged albuera, crime, delima, drug lord, drugs, duterte, kerwin espinosa, killed, leyte, really, rolando espinosa, who.